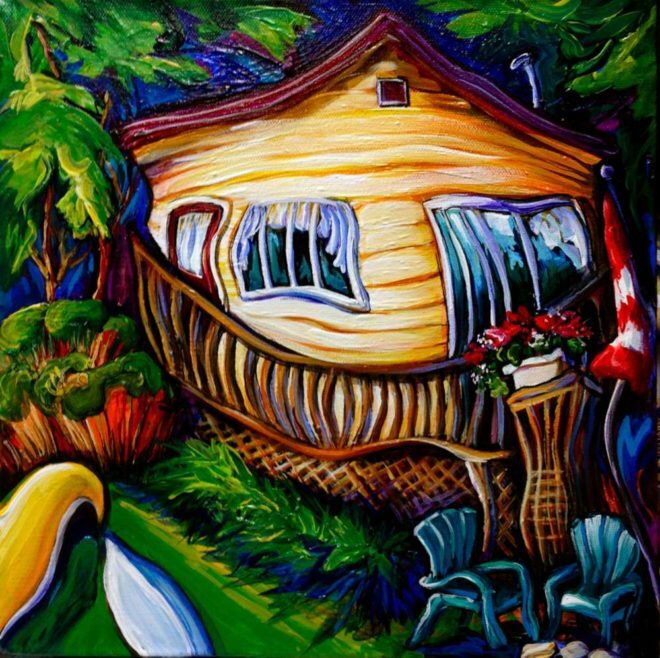 This cottage sits on the shoreline of Lake Wenona in Ontario. 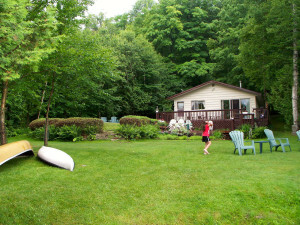 It’s a lovely place surrounded by the lush green Haliburton highland woods. The lawn is much more sprawling than it is depicted here. In real life there’s a gentle incline towards the bass-rich lake and more room to play, but I wanted to capture a sense of busyness and closeness so everything is more bunched up. Some important representative parts include the bright yellow canoe, the well-tended flag pole, and the fire pit with comfortable Muskoka chairs around it. The fire pit is the gathering place – evening sunsets, marshmallows, cocktails – so that’s especially significant. Architecturally, the cottage walls appear to bulge outwards, a distortion that suggests that it’s full of life and memories. The curvature of the deck and windows almost gives the impression of that old “Have a Good Day!” happy face icon of the 70s, but this one’s winking. It’s a cheerfully symbolic representation of good times, grandkids, and the great Ontario outdoors.